Here is another brief glimpse into my working methods on location. I felt it might be of interest to other artists who follow my blog. 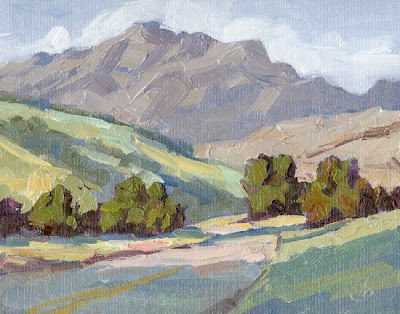 Half the battle in plein air painting is in knowing how to begin. I recommend sketching the large shapes of the composition very simply with thinned paint on a brush, as in step (1). Next I establish the darkest darks (2) against which all subsequent tones will be compared. Then I “capture the fugitives,” which means anything that can disappear or escape as I paint. 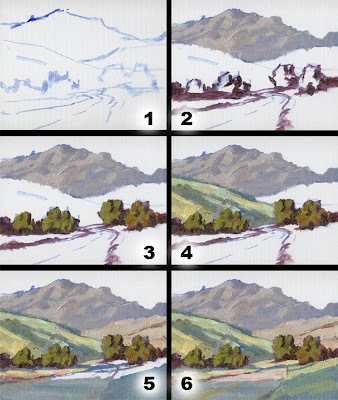 In this case it was the light effects on the mountains and trees (3), followed by the shadows across the hillside (4) and the foreground shadows (6). With this under control I moved on to the sky, then I continued to develop and refine various parts of the painting until it was complete (see large image above). I hope this little demo was useful. It is not nearly as detailed as my art instruction CDs and DVDs but it gives you a glimpse into my working methods for a typical plein air painting. Thanks for looking.